The fact is, the Marin Family Court has never been reviewed for judicial misconduct, cronyism, favoritism or bias (to our knowledge) because the Marin Superior Court, the California Judicial Council and their legal cronies have religiously lobbied to exclude these very topics from every formal investigation that has been done in Marin County (hmm, anybody wonder why?). Mrs. Brekhus misstates the results of these investigations in an attempt to discredit the important work that CJE and our allies do to protect domestic violence victims and abused children in the courts, work which is validated and borne out by the Official State Audit of the Marin and Sacramento Family Courts. When Marin family court mediators cannot prove that they’ve received even the most basic training in domestic violence and child abuse, it doesn’t take a rocket scientist to recognize that abused kids are gonna get hurt by untrained employees who cannot detect dangerous parents and therefore force kids to visit unsupervised and live with them. Brekhus was part of an entourage of four Marin attorneys who apparently didn’t understand that the 26 different public comments made to the Judicial Council that day were from litigants from all over California, from San Diego to Siskiyou counties. Their defense of the Marin County Family Court seemed oddly out of place given the echoes of similar child safety concerns from nearly a dozen other counties. 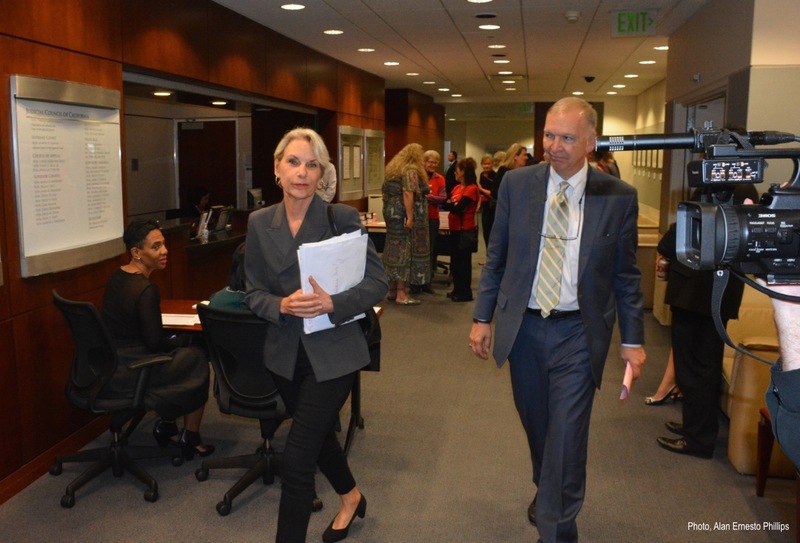 Neil Moran from the Freitas McCarthy Law Firm was seen in the hallway outside of the October 27th California Judicial Council meeting, pictured here with Marin attorney Barbara Monty, after she spoke to the Judicial Council in an attempt to defend the Marin Family Court.